We have some good news and some bad news! The good news first. 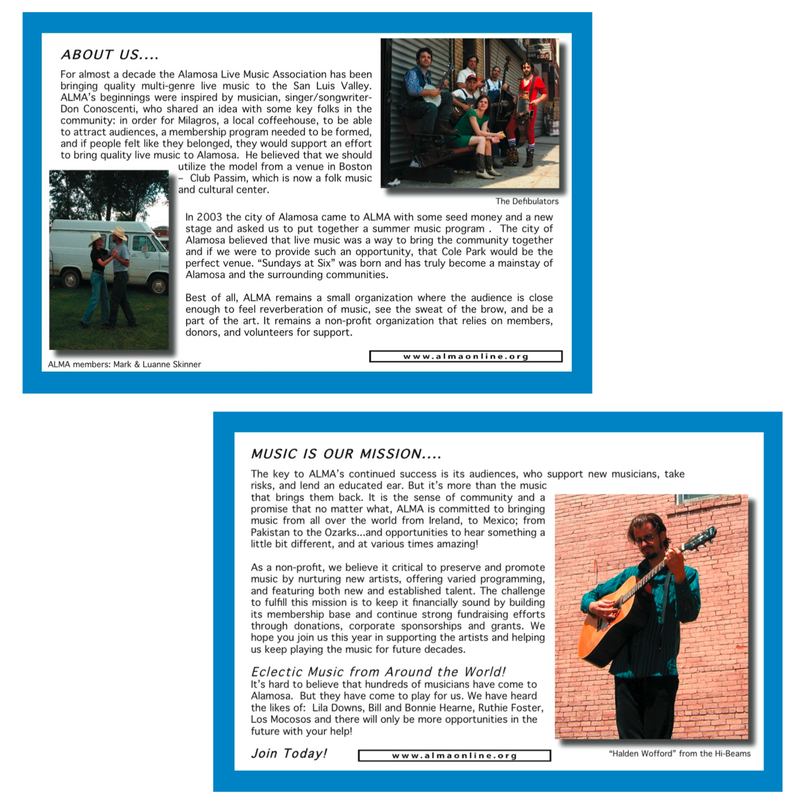 We have an offer from the Daniel and Janet Mordecai Foundation to match $4000 in new memberships, or members who increase their membership level for 2011. Now the bad news. This year we’re ineligible for Colorado Creative Industries (previously the Colorado Council on the Arts) funding, which is requiring us to take a year off. So, Sundays at Six is in jeopardy for next summer unless we are able to raise some serious money. No sunsets peeking through the swaying figures of entertainers grooving onstage. No dancing barefoot on the grass to the beat of some incredible drummer. No children swinging on the swings as their parents enjoy an evening’s repose. No potluck picnics with friends from near and far. 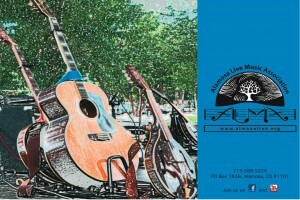 Another glorious summer in Cole Park with great music. Sauntering into the park knowing that 8 years of live music will continue due to your generosity. Sitting in your folding chair and tapping your toe to San Luis Valley Big Band, the newest retro Swing Band, or Mariachi San Luis. Breathing a sigh of relief when the threatening clouds move from the Sangres to the West, saving us from Showers at Six! Clapping your hands in delight with the knowledge that you helped bring Sundays at Six to your community. 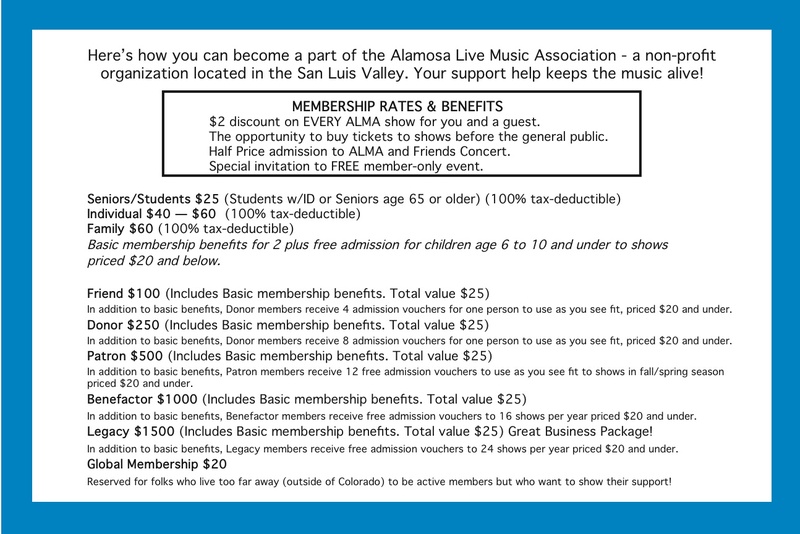 We hope you will consider this investment in the Alamosa Live Music Association. Please look at our membership brochure, choose one of the levels of membership, and send your contribution to P.O. Box 1836, Alamosa, CO, 81101. 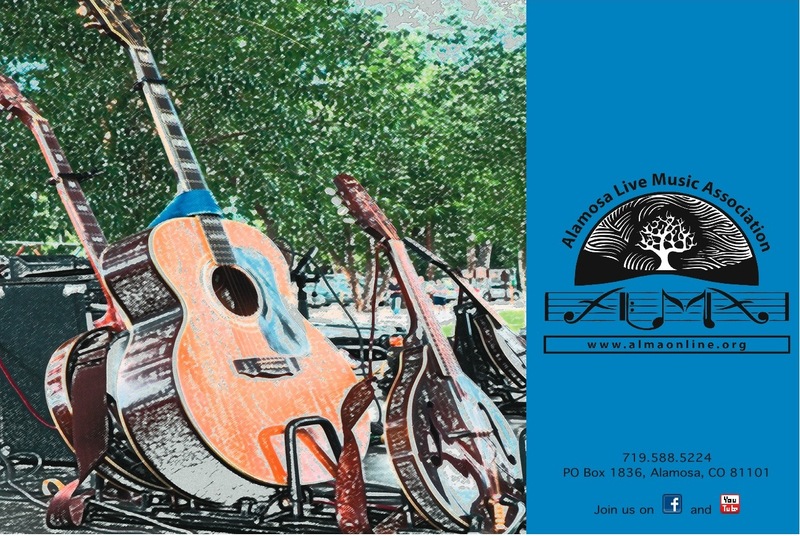 Many of those levels include coupons for the concerts we are presenting throughout this season: concerts with the likes of blues singer Eric Bibb, who has been nominated for a Grammy in the past, and the Infamous Stringdusters, who are up for the best country instrumental Grammy this year. Thank you for considering making your investment in ALMA today! P.S. Remember every little bit helps & all members will be invited to a members-only event!